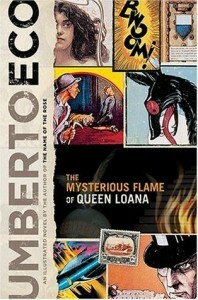 The Mysterious Flame of Queen Loana, Umberto Eco (trans. by Geoffrey Brock), Houghton Mifflin Harcourt, 2005 (c2004), ISBN 9780151011407, 480pp. Umberto Eco is one of those authors I really think I should like: his ideas on creativity, the connections that exist between people and culture, and his cleverness are all things that I admire. Unfortunately, I find his prose style dull and his plots prosaic and long-winded. I never could make it through The Name of the Rose and every time I looked at one of his other novels in the store, I walked away without purchasing it. I ended up buying this one, his most recent, only because I (a) had a gift card, (b) it was 50% off, and (c) it purported to be an illustrated novel, with some kind of connection to comics, a favorite subject of mine. I figured, this had to be an Eco that I liked, if I was going to like an Eco. I didn’t like it, mainly because it is a “little” novel and not as clever as I had imagined it would be. The setup is grand–a sixtyish rare book dealer named Yambo has some kind of stroke that wipes his personal memory clear but leaves his cultural memory intact. This allows Eco to play a wild game of cultural word association as Yambo tries to deal with his close family, whom he doesn’t recognize at all, by connecting them to books, movies, and music that he can remember. Yambo starts to delve into his own history in the most intense way, revealing that it is impossible to “go home again,” simply because it took him 60 years to make those memories, and it would take nearly the same to recreate them through a personal archaelogy. But that’s the book, basically. It fails to go anywhere from there, but stays focused on Yambo’s intense internal conflict, so much that after awhile it becomes only a device for the author rather than a means to advance the plot or some greater idea. There’s a jolt about two-thirds in, where I expected something to happen, and something does, but something that drives Yambo even further inside himself. I don’t think it’s a problem of translation, either. Simply, what interests Eco about his ideas is not the same thing that interests me, even though we both find the ideas themselves intriguing.